Touring internationally is a challenging and often risky experience for musicians, but there's nothing quite like playing your music to audiences who lead radically different lives from you oceans away. It's also a necessary step to move up to the next level and push your music beyond national borders. 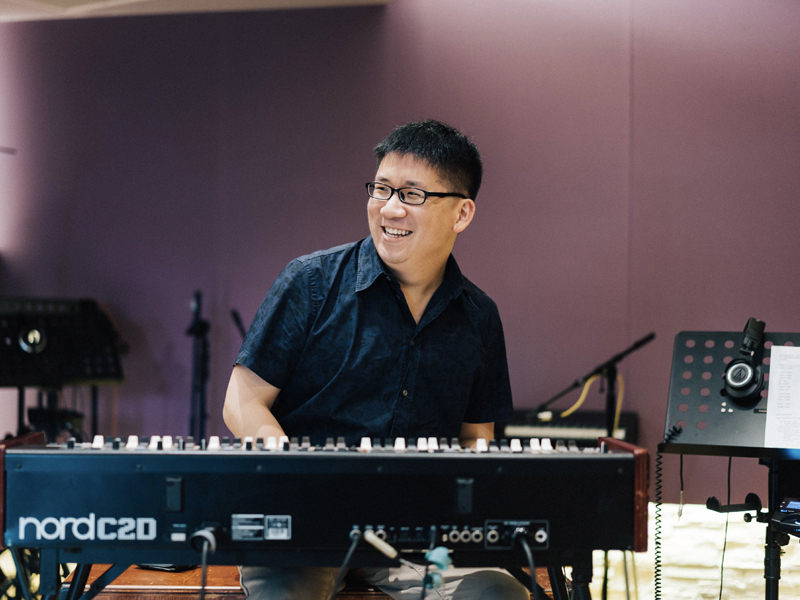 In our small country, it's not difficult to find Singaporean musicians eager and hungry to show what they can offer the world. Bennett Bay, Chok Kerong, In Each Hand a Cutlass and The Steve McQueens are just some local artists who've hustled abroad. These Mosaic Associate Artists will all be staging concerts in Singapore soon – The Steve McQueens will be kicking off their Asia tour behind forthcoming album TAPE, while Bennett Bay will be launching his sophomore album In Memory Of – and before they take to their respective Esplanade stages, we talked to each of them about their experiences touring abroad and what tips they can offer artists who'd like to make the leap. Where and when was the last time you performed abroad, and how did that opportunity come about? The last time I performed abroad was in September 2017. The performance was in Ireland at the Electric Picnic Festival held annually in Stradbally. The opportunity came about while Chris was in talks about me returning to perform for Neon Lights a second time, to which Declan, the then owner of Electric Picnic suggested that I came to Ireland to perform at that festival. Share a great memory from a time you performed internationally. There were many great memories from the trip to Ireland. One of them came during our third day in the country, on the morning of the day we were to perform. It was freezing the night before as it was raining heavily, and we rushed to our tents and headed straight to bed without a second thought. By the morning it was still very cold, around 4/5 degrees, and we woke up and walked around hoping to warm up a little. As we walked into the festival grounds we came across a dying campfire, just a ways away from the stage we were to perform at. And so we gathered more wood and fed its flames. For like the next hour and a half we sat around the campfire as we made friends with volunteers at the festival who came by to warm themselves up, it was surreal and cold yet warm and comfortable at the same time. What's the biggest takeaway from your experience playing abroad, whether as a musician or as a person? The one thing that I truly believed in and felt after playing in Ireland was that the human spirit remains the same. While I was there, observing different everything, people watching the various performances, dancing along, laughing and talking to each other, getting drunk, passing out on the grass and having your friends look after you, it all felt familiar and it felt safe. It felt as though while these people lived more than 10hours from where we did in Singapore, there wasn't really anything that felt different. Of course, there are cultural aspects, aspects of society that differ greatly from where we come from, but at the end of the day what the people truly want is to have a good time, to enjoy life to its fullest and to be there with their family and friends while it all happens. And I don't think it matters what kind of music is being played, different genres can affect you at different points of your life because of whatever circumstances you have within yourself, and as we walked around the festival grounds we saw people from all walks of live grooving to every genre there was. It just made me even more certain that there's always a place for any genre of music in this world, it's like a jigsaw puzzle, and truly believing in what you do and what your music can do is the best way to fulfill your duty to this world and to the people that reside in it. Any travel tips or hacks for musicians headed abroad? When it comes to travelling to cold countries, I'd say pack more layers. We slept in tents during Electric Picnic and it was the coldest place I've ever been without extra layers. What are some countries or international venues that are on your bucket list to visit or perform at? The three main countries on my list to perform in are Australia, Iceland, and Japan, or really anywhere that's quaint and peaceful, if I had the choice I'd visit every country I could. In terms of venues, the Royal Albert Hall is really the only venue I've really itched to perform in from another country. Bennett Bay will perform at the Esplanade on Sunday, 9 September. More info here. I performed abroad most recently at the 2018 Melbourne International Jazz Festival ("MIJF") with my organ trio. This was a result of an exchange programme between the Singapore International Jazz Festival and MIJF, as well as the Esplanade putting my name forward for this. 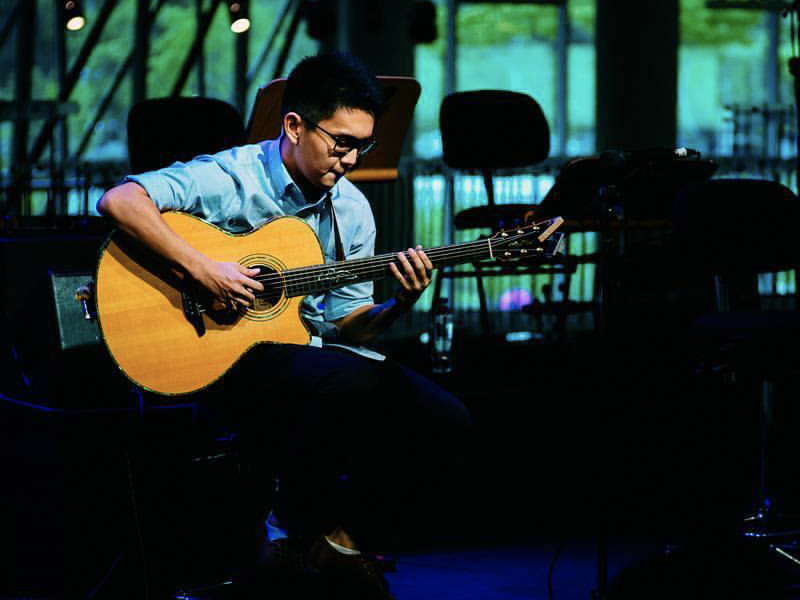 I recently collaborated earlier this year with Hong Kong-based guitarist Teriver Cheung on Departure, a concert featuring both our compositions for chamber ensemble. We wrote new pieces and arrangements specifically for this group which consisted of a string quartet, trumpet, saxophone, trombone, oboe/english horn, drums, guitar and hammond organ. It was really challenging to perform all this new music, but I learnt so much from doing it. Overseas, the audience is likely to be less familiar with my work and story as an artist. This allows me to assess the effectiveness and clarity of the performance more objectively. In your list of things to pack, include backups whenever possible – a spare pedal, additional copies of sheet music, extra cables etc. All sorts of issues can come up when you're performing overseas, so it's always good to be prepared. I would love to bring my music to Europe one day. Daniel Sassoon: It’s been a couple years – time flies when you’re a working adult trying to make ends meet in the real world! Our last overseas show would have been in 2016, at the Concrete and Grass music festival in Shanghai. It was the last one we did as part of a run of shows in China. Our then-agent put something together with some leads we had there. At the end of the day, the reality is that it’s not difficult to score a show overseas - it’s just whether you’re willing to cough out some amount of expenses because rare is the opportunity that you’ll get full board, lodging and travel as part of the offer when you’re an independent act. The NAC’s various schemes have been a lifeline for many bands here by providing a travel budget thus enabling them to tour, so kudos to NAC for helping to make that happen. 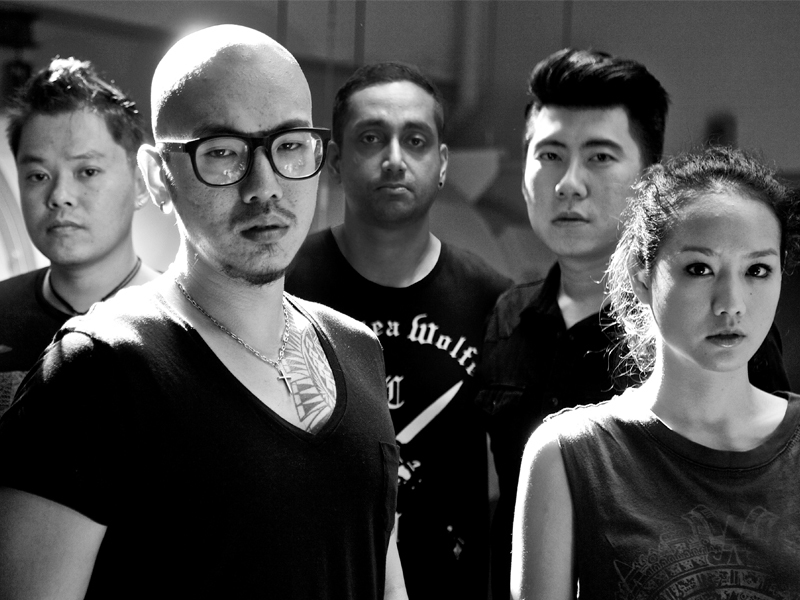 Nelson Tan: We were in Hong Kong back in 2013 and we had a gig with 2 other bands playing before us. So as usual we were chilling backstage waiting for our turn to setup. The second band was already playing for almost an hour so we figured that we should be up soon. Around this time one of the organisers walked into the dressing room and told us to hang around as we would be up next. The problem was he had no idea when the band would stop playing because even though they had a set list, they never talked or said anything while they were playing. So all we could do is wait. At one point the band held a super long sustained note for like 1 min and everyone clapped so we thought right, that's our cue to set up, but then they carried on playing. It was an awesome night of music. 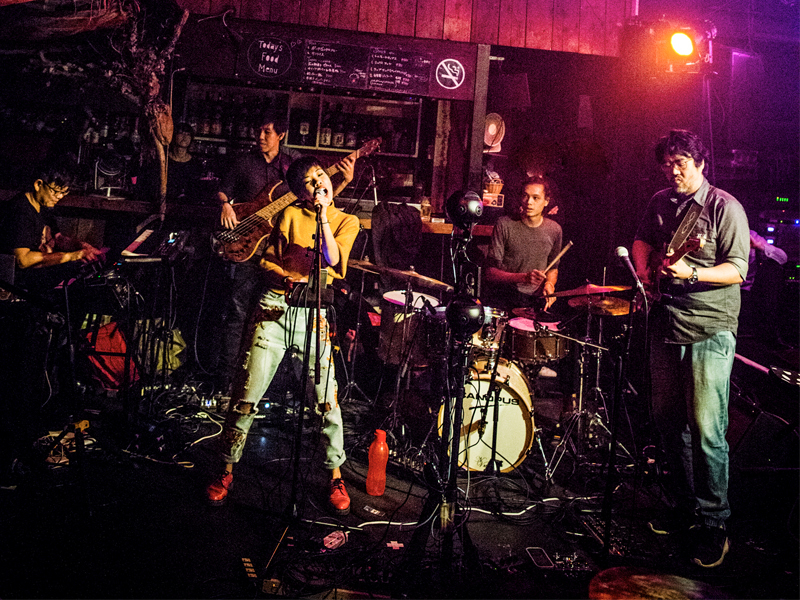 Sujin Thomas: Hong Kong was our first overseas gig. We were finally playing to an international audience and we needed to make sure we brought our A-game along with us on that plane. We rehearsed like never before, honed our chops and when it was time to deliver, we brought it. There wasn't going to be a chance for redemption if anything went wrong and we knew it. The experience brought us closer as a band too since we did everything DIY. Being on the road has taught us to look out for each other too. We are constantly reminded that we are a team, and we need everyone to be in tip-top shape, not missing any gear or running into any difficulties that would hinder us from doing our best whether it be anything physical or even mentally and emotionally. On a personal note, overseas gigs have toughened me as a person. When we play overseas, we are no longer on familiar turf, and we are to expect anything and everything. I've learnt to be highly adaptable, to go with the flow and just deal with it as it comes. We've successfully dealt with all kinds of situations from problematic airport staff to Category 5 typhoons. As a person I've also learnt to take better care of myself especially if we play gigs on consecutive nights. I've learnt to drink less, sleep early and to never apply muscle rub on my weary thighs before gigs (long story there). Jordan Cheng: One thing I’ve learnt is to always travel light! When you’re gigging overseas, having 10 minutes of soundcheck plus setup is common. The last thing you want to be doing is lugging a full load of gear on stage while trying to get the best sound possible in that short amount of time. Less is more! Another tip would be selecting and bringing the right gear for the job. Like, as a drummer, hardly one would have the opportunity to have multiple snares setups for different songs. I tend to choose deeper snares when gigging overseas. It’s more versatile in the tuning range without encountering loss of “body” or not being able to cut through the mix. Acoustically, this matters as you could be playing in a club venue for the first show and on a big stage the following day. Amanda Ling: Japan has been on our long time wishlist for us. Russia and Europe would be on that list too as we do have quite a bit of a following in these two countries. It would be super fun to have a Russia/Europe tour at some point if our pirate stars align! Our last tour was to Japan. Our Japanese promoters were excited to launch our new album Terrarium locally and together with Clarence (from our super-amazing management, Foundation Music) set up several double bills with our Japanese musical soulmates Za-fee-do. We also played the beautiful Motion Blue Yokohama, our first time playing in one of the famous Blue Note Japan venues! Josh Wan: For me, sitting stage side at the O2 gig watching Incognito do their soundcheck was a moment! We were opening for them that night and were waiting for their soundcheck to be done so we could do ours, just 2 bands lining up for stage setup time, pretty standard stuff right, except these were music legends Incognito! 35 years playing and travelling together and still owning every stage. I quietly registered a resolution to eat more fruit and veg and maybe exercise a little more. The world’s a big place! But humans will always find their way. The ability to overcome is our most remarkable thing right? Except maybe in the Tokyo Shibuya Station. Travel with an open mind, exposing your art to new air enriches both the audience and the music itself, but we have to let it, and that’s harder than you’d think. The Steve McQueens will be performing at the Esplanade on Friday, 3 August. More info here.